Fives’ customer depend on its Gardner abrasive discs to deliver more up-time, closer tolerances and longer life than competitive products because its team of highly trained engineers do whatever it takes to make it happen. Fives is totally committed to both the quality of its Gardner abrasives discs and the quality of the parts its customers produce with them. Fives leads the industry with its custom-formulated Gardner Abrasives grinding wheel. Each disc, or wheel is designed using decades of abrasives application and processing experience to satisfy the customer’s particular requirements. The cost of grinding is directly related to abrasive performance. That is why high performing Gardner Abrasives products, tailored to specific grinding applications, result in lower overall grinding costs. Fives’ wide range of Gardner Abrasives grinding wheels are specially engineered to meet specific grinding requirements. With today’s demand for grinding cost reductions, Fives supports it customers with access to a Gardner Abrasives specialist, backed by engineering and research personnel, that specifically tailor the right abrasive for each customer application. 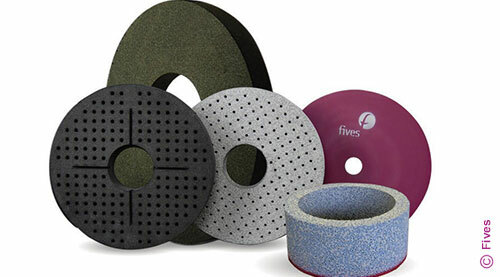 Fives offers its customers custom Gardner Abrasives solutions to exceed their grinding needs. Fives offers a wide array of Gardner wheel types that will optimize its customer’s grinding process.